Today I wanted to show you my latest outfit in which I incorporated my newest pants! I have been dying to get a pair like these ones for a long time, therefore when I got them I had 100..000 ideas of how to style them. So this is one example of my ideas. I basically kept it simple- black & white, but with a touch of color, by my burgundy heels and lipstick & nail polish! I also added a little neon necklace, but sadly, you cannot see it that well in these photos. Also the weather in Latvia has been improving- the snow has almost melted, so I am finally nearly able to throw my winter clothes into the closet, so that’s why for this outfit I wore my leather jacket! I have heard that on Thursday it will be almost +19 degrees by Celsius I am pretty excited about that! How is the weather in your country? I absolutely love your outfit. Those pants are so wonderful and they look great with those shoes. You look beautiful. Gorgeous outfit! You look wonderful and I love those pants and the heels. You look STUNNING in those pants! Seriously amazing. love everything about this outfit, those pants, shoes, clutch! i'd totally rock this! They look amazing on you! Makes your legs look even longer! I absolutely love that outfit! very chic! love it! the subtle pops of colours from your necklace & shoes are great! wish i have legs like yours to pull of stripes pants! I adore this outfit, those pants are amazing! I love love love stripes and they look perfect with those heels. Gorgeous. New follower on bloglovin. Hope you can stop by my blog soon. You look great in these pants! I like how you styled them! Great outfit. These pants are very nice. Tev tik labi izskatās. Es sev arī gribēju tās bikses, bet man nepastāvēja. This outfit ist perfect. I love Stripes and you are so beautiful! These pants and shoes are made for each other. It's totally spring time here. And i adore the clutch, where does it come from ? amaziiiiing outfit! you are gorgeous model, dear! You look amazing!! Love your striped pants! I love your pants 🙂 Great look! P.S. I also happy to be your newest follower. great job! You look great with the pants! Ahhh those pants! Looks like I'll be making a trip to H&M! Been dying for a pair of striped pants. I need them! Beautiful, elegant and classy. Love the maroon as a pop of color! Love these pants! Your legs look endless. Thank you very much for you comment on my blog! I'm following you now! I hope to see you again by me! Wow, you look amazing! Those pants make your legs go for miles! Beautiful outfit! You have the perfect long legs to pull these pants off–I'm jealous. You look amazing! I told yu they would look perfect on you.. and ohh myyy! those shoes!!! I looks great with those wonderful pumps. love in how many ways you can style those pants, i also have thousands of ideas!! love how you kept it simple, black & white with some color accents! Love your style, looking great! Wow, so amazing beautiful pics >3 You look pretty! I really love this look, especially the pants and the shoes. Very GLAM. I am now following you on GFC and would love if you could follow me back. really loving your stripes pants! and love your pumps! love the whole outfit hahahahaha. I am already following you now in GFC btw, mind following each other? xo. Maddie.. You are so beautiful!!! Love this gorgeous look and every piece of it! Sure wanna follow each other-Following in GFC (rosita bizerman) and bloglovin. Hope you'll so the same!!!! I just love your new pants! I really love all the stripes this season! Those gorgeous pumps are the perfect accessory! You look so chic and elegant:))) Great stripes-outfit! Oh My Word. Your blog is great! I adore this outfit and you look so stunning. I've been wanting pants like those >.< they're so cool. Of course I'll follow you on Bloglovin and GFC! p.s It's usually sunny where I live. We gt rain sometimes but it never snows. 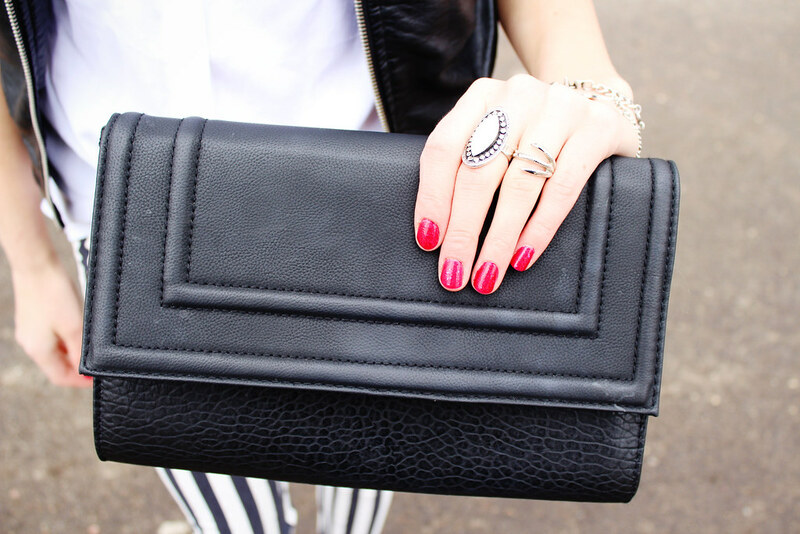 Loving the black and white look with the pop of red. You look absolutely stunning! Love the stripes and your style. Thanks for leaving the commdent on my blog of course we can folloew each other. I've followed on bloglovin so you can follow back. Hey gorgeous!! Thank you so much for your comment 😉 of course I would like to follow each other!! You look great with this outfit, I'm in love with your shoes 😉 kisses!! Beautiful! I am loving striped jeans! Ooo, those heels are gorgeous. wow you look stunning girl! i adore those striped pants! of course i would love to follow each other! Such cool pants! It's said that verticle stripes really longate your legs and seeing this post, I totally agree. (Maybe I just invest in a pair as my legs are short:p) You look lovely, darling! BTW-Great blog title. It made me smile! Ļoti skaists komplektiņš! Kurpes & bikses fantastiskas! Kopā viss izskatās lieliski! Perfect outfit!! i love those pants..